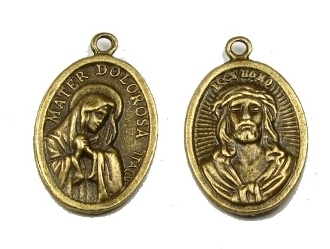 Our Products >> Sorrows Mater Dolorosa Ecce Homo Sorrows Bronze Finish medal 1"
Sorrows Mater Dolorosa Ecce Homo Sorrows Bronze Finish medal 1"
Our Lady of Sorrows (Latin: Beata Maria Virgo Perdolens), the Sorrowful Mother or Mother of Sorrows (Latin: Mater Dolorosa), Our Lady of the Seven Sorrows or Our Lady of the Seven Dolours are names by which the Blessed Virgin Mary is referred to in relations to sorrows in her life. Under this title, she is the patron saint of Slovakia, the state of Mississippi, the Congregation of Holy Cross, Mola di Bari, Apulia, Italy and in Barangay Paloway, San Andres, Catanduanes, Philippines. The Seven Sorrows of Mary are a popular devotion in the Roman Catholic Church. There is a devotional prayer which consists of meditation on her Seven Sorrows. Also, there is a corresponding devotion to the Seven Joys of Mary.